Located around the corner form 1063 Virginia Avenue, directly facing the Fountain Square Plaza. 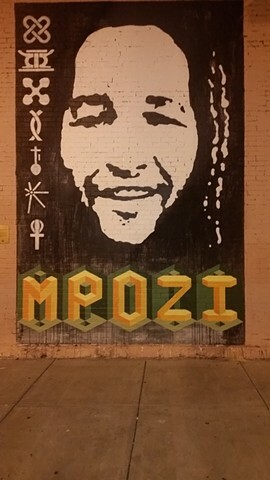 The location of this mural is special to us as it is connected to the Murphy Art Center where Mpozi had an art studio. It also faces the old Deano's Vino spot (now Pioneer) where he, Mike Graves and Justin Cooper held a Thursday night dj gig for several years. Feels good to have this representation in our neighborhood. My favorite part of this mural is the depiction of the Seven Symbols of African Humanism. Mpozi was raised to reflect these values in his daily work and life. We feel that all people can benefit from mindfulness and practice of these principles: unity, self determination, collective work and responsibility, cooperative economics, purpose, creativity, faith.